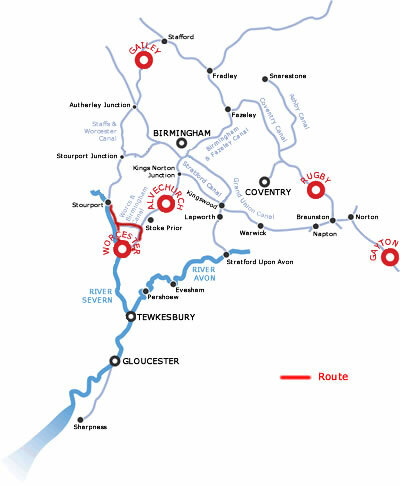 One of the shortest Rings in the Country, this circular route can be done over a mid week break, and takes in the Roman spa town of Droitwich, and the cathedral city of Worcester, also cruising along the River Severn with lovely views of the Cathedral, and the newly opened Droitwich Canal. Cruising on the River is very different to the Canals, there is no continuous towpath and therefore no right to land and moor up as you please. The scenery is one of quiet water meadows & prolific bird life. Moor up only at recognised sites . You are responsible for assessing whether it is safe to use the waterway in flood or strong stream conditions, but note that CRT may decide not to operate its locks. Leave the Stourport Basin through the closest locks to you, and turn left to go down the River Severn. The River winds its way through lovely peaceful countryside until you reach Holt Fleet , which takes about 2.5 hours, and you can moor up with a couple of pubs just after the bridge. Soon you will see the entrance lock at the start of the Droitwich barge Canal. There are pontoons on the left of the lock where your crew can get off. The River Salwarpe accompanies the canal all the way to Droitwich, but don't mistake it for the entrance to the canal. Lock number 1 at Hawford is soon reached and beyond this after a short sweep of the canal is Lock 2. 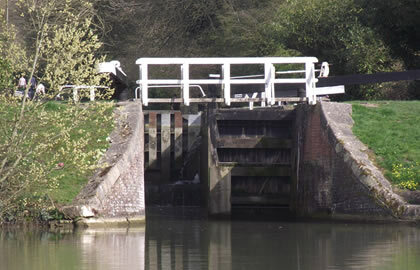 Note that the locks on this canal do not have lower wing walls, so care is required when approaching them. When you go under the A449, be careful as the headroom reduces at the far end. The canal nows goes through a short wooded stretch before approaching Linacre bridge when the views open out on both sides to reveal distant hills and rolling fields. The approach to the Mildenham lock is heralded by trees on both sides. The mooring bollards are on your right, so you can let your crew off to get the lock ready. You will soon approach the Ladywood set of 5 locks spaced over half a mile, as you rise in the flight the flight, the countryside opens out to either side. By lock 8 you must cross the road bridge to operate the lock. Beyond Ladywood you approach the small village of Salwarpe, there is access from the towpath to the village through a wooden gate. There is also a picnic table just before Salwarpe, by the old disused Hill End Swing bridge. As you pass through the cutting just past the village sound your horn to warn approaching boats as there is a very sharp corner, you also have views of the lovely half timbered Salwarpe Court up on the right. There are footpaths here down through the woods over the River Salwarpe, and there is a picnic table by the abandoned Salwarpe Court swing bridge. There is a rumble of traffic as the A38 crosses the canal, there is also a path down to along the river bank from here. The canal is now entering Droitwich, but the canal is lined with mature trees and the houses do not intrude. Just by bridge 11 there is a Leisure Centre. To get into the town centre, go through Vines Park and follow the canal until you see Waitrose supermarket, then cross the road and walk behind it to the shops. Droitwich was also known internationally for its powerful long wave transmitter which was built in 1933. During World War II the transmitter was initially used to broadcast to occupied Europe, and then to jam signals to enemy aircraft. Most of the historic Droitwich lies to the south of the canal, in an area enclosed by Saltway, and is easily explored. There is a small museum devoted to the salt industry & the Droitwich transmitter in the Heritage centre in Victoria Square. Close to here is a medical centre and a post office and banks. The canal winds through Vines park, where there are a series of 3 swing footbridges, so your crew can walk alongside the boat for a while! The bridge require a BW Watermate key to unlock them. Droitwich barge Lock is at the end of the park, there is a swing footbridge over the middle of the lock which must be unlocked & swung open before the lock can be used. This part of the canal is suitable for narrow beam canalboats only. After passing under the road at Swan Drive, you head to the right to enter lock 7, which again has no wing walls so requires care to enter it accurately. You will soon see a waiting staging on your left, where you should wait if boats are coming the other way through the M5 culvert. The culvert is not wide enough for 2 boats, and is very low- with headroom of just 6 foot 5 ins. Lock 6 is soon reached. Locks 4 & 5 are the only staircase locks on this canal, so first make sure there are no boats coming down. The bottom lock of the staircase should be empty and the top full. After the Rugby club bridge is the entrance to the new Droitwich Spa marina. Locks 103 are quite deep, so take care when opening paddles there is a water point above Lock 1. At the junction of the Droitwich and Birmingham & Worcester canals is a small picnic area, and the Eagle and Sun public house with canalside grounds. You are turning a sharp right which is a tight turn, and the bridge makes it a blind exit, so you need a long blast on the horn to warn other boaters who will not be used to boats coming out of this junction. Hanbury Wharf canal village is just south of the Bridge, and has a small cafe, and water is available for a small fee. Moor here for the night it is 6.5 hours to here. In 2 miles you reach the short Dunhampstead tunnel and beyond are moorings for the Fir tree pub Tel,01905 774094. In another 2 miles the village of Tibberton is reached, there is a nice pub canalside called the Bridge Inn. Tel 01905 345874. There are stores & a garage in the village. After Tibberton the canal descends the 5 Offerton Locks , followed by the 6 locks beginning with Tolladine Lock, which marks the beginning of the descent into Worcester. Down the Birmingham & Worcester canal & soon you will encounter 2 more locks, one called Blockhouse lock, followed by Sidbury lock. There is a water point just above Diglis lock. The basin is a short walk from the City centre, where you can explore the lovely cathedral dating from 1074. There is a wealth of stained glass and monuments to see including the tomb of King John. Also a good place to visit is the Museum of Worcester Porcelain, which not surprisingly has the largest collection of Worcester Porcelain in the world. The Guildhall in the High street was built in 1721 and has a fantastic elaborate facade with statues of Charles I and II and Queen Anne. In Friar Street is Greyfriars, dating from 1480, this was one part of a Franciscan priory, and is one of the finest half timbered houses in the country. Charles II escaped from this house after the Battle of Worcester in the civil war in 1651. In the George Marshall Medical museum you can meet the past heroes of medicine. Regular bus service from Crowngate Bus station. Close to Sidbury lock is the Commandery Civil war Centre, a museum devoted entirely to the story of the Civil War, The museum dates from the reign of Henry 8th and served as Charles 11's HQ before the Battle of Worcester in 1651. From Diglis basin you enter the Diglis locks- 2 deep locks which take you out onto the River Severn. The locks are under the supervision of the lock-keeper, who should tell you whether it is alright to proceed onto the River Severn, but to make sure look out for the red, amber and green water level gauge to see if the Severn is in flood or not. After coming out of the last lock onto the Severn, it is best to head towards the far bank heading south(in the opposite direction to which you will be headed) and then turn the boat to pick up your crew from the pontoon near the lock. So you do a half circle anti clockwise, the river is very wide so it is easy to do. Heading upstream the River passes the imposing cathedral and then the fine five arched bridge. The famous racecourse is on your right, and there are moorings here, also a water point. The River winds through pleasant countryside to Bevere lock, but just before here is the Camp House inn pub on your left, with moorings. If you moor on the River leave your rope loose because it is tidal. For opening hours of the British waterways operated Bevere lock see the CRT website. You pass some lovely countryside on the way to Stourport and cruising up the River Severn . It is 7 hours back to Stourport.